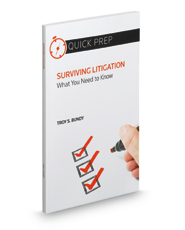 Whether you are contemplating a lawsuit or involved in one currently, Surviving Litigation is an essential guide to help you take control of a situation that can often feel like an uncontrollable freefall through the American court system. With more than 20 years of experience in personal injury litigation, the author has litigated everything from routine auto accidents to complex multimillion dollar catastrophic injury cases in both state and federal courts. In each chapter, he walks you through the process and strategy issues confronting those either currently involved in or anticipating lawsuits today. Specific topics covered include representation, litigation expense, basic legalese, the discovery process, and strategies for case resolution, among others. This book is a must-have for anyone, plaintiff or defendant, who hopes to obtain the best outcome in his or her case. Simply understanding what's next and knowing the questions you should be asking your lawyer will enable you to more effectively navigate the process toward a successful resolution.